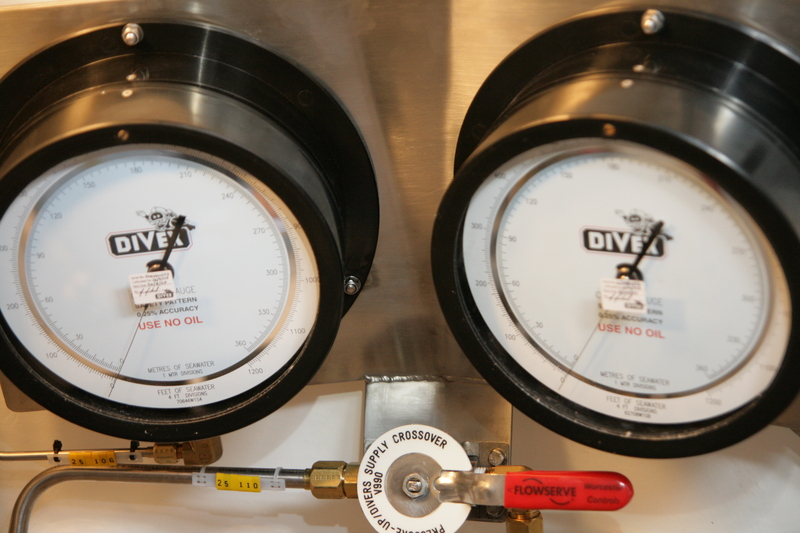 Divex caisson gauges register ambient pressure against a known reference pressure (usually surface) to monitor diving chamber pressure internally. Sealed environment caisson (SEC) gauges are the main type and design of caisson gauge stocked and recommended. The main mechanism is totally protected from the environment by being housed within the gauge in a sealed brass case. A comparison of designs is given below. 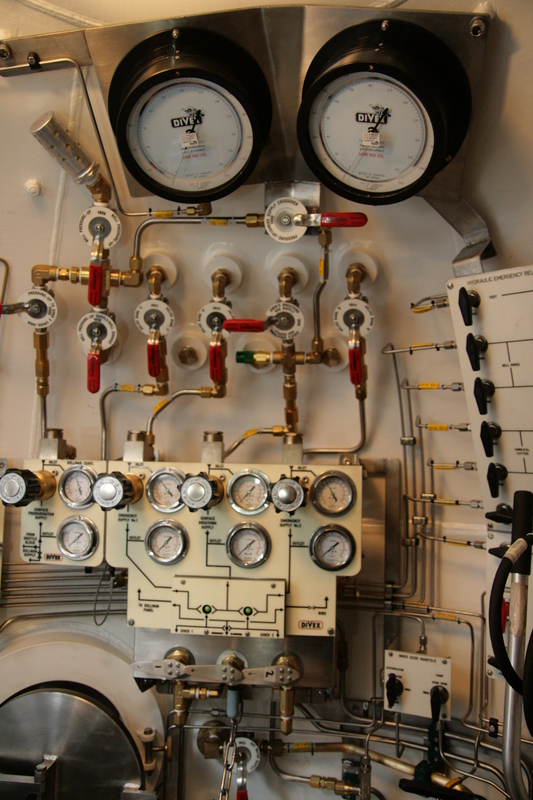 'Fleximount' capability is not available on these gauges due to the size of the internal housing and mechanisms, but the gauges are all ABS plastic cased. 6" and 81/2" 'Fleximount' sizes. Indicator drive magnets can not align out of phase. Standard accuracy: 0.25%. Optional accuracy: 1.0% (Air Dive Caisson Gauge). Wide selection of ranges single or dual scale available within basic price. Sealed Environment Caisson Gauges (SEC) are designed to meet the most demanding of diving applications - on board diving bells - Foundrometers SEC gauges are accurate to 0.25% and incorporate as standard every conceivable feature of safety and long life. The Bourdon Tube sensing element is enclosed in a stabilised environment which is sealed at a known reference pressure (usually atmospheric) to allow true pressure readings regardless of ambient variations. Because absolute sealing of the caisson is vital, movement is transmitted through the caisson wall by a matched pair of powerful magnets which have been developed to eliminate possible out of phase alignment, one magnet is fitted to the instrument mechanism sealed within the caisson and the other forms part of the jewelled pointer carriage. For safety critical applications, this is the choice of caisson gauge. Precision internals are fully protected from corrosive environment and sudden severe temperature changes. They can be calibrated on-site using standard equipment. This is particularly relevant to shipboard service away from port. True reading against any known reference pressure. Heavy brass caisson gives internal components additional protection against mechanical shocks. Greater application versatility e.g. with caisson reference pressure set to give zero reading for known bell depth at vertical position on dial, diver's position above or below bell can be indicated on left and right hand scales.